Scott and his friend Rollo are both renegades, but both in their own unique, quirkyÂ ways. While Scott commits minor acts of vandalism against police vehicles, and willfullyÂ ignores building codes when renovating his house, Rollo eschews civilization altogether,Â living alone for months at a time in the dusty Arizona wilderness (the eponymous HighÂ Desert). When Rollo, never friendly with the state Forest Service, is kicked out of his squatter’sÂ cabin by rangers, he escapes to the relative safety of Scott’s home in Flagstaff. WhenÂ he is then blamed by government officials for a large wildfire ravaging the western state,Â he drags Scott and his girlfriend Lani into a dangerous chase that will pit them againstÂ Forest Service rangers, wacko environmentalists and a plot that could threaten the livesÂ of hundreds of thousands of people. J.D. 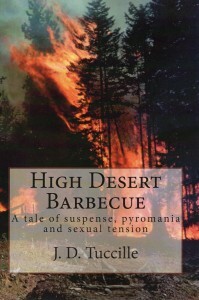 Tuccille’s first novel, High Desert Barbecue , is a great read. Filled with likableÂ characters, tons of humor, and a nice sprinkling of libertarianism throughout, its breezyÂ style makes it an easy story to pick up and get into. Tuccille’s writing is fast and fun, and he manages to incorporate a libertarianÂ perspective without becoming pedantic or preachy, instead weaving it deftly into theÂ storyline. For instance, when Scott first meets his next door neighbor and futureÂ girlfriend, Lani, he has just woken her up with some loud construction work. The man shook his head and interrupted. Lani stood at the doorstep with her mouth open. Then she smiled. I did have a couple gripes with High Desert Barbecue . While Tuccille’s main charactersÂ are well fleshed out and believable (if excessively comedic) the baddies are a little tooÂ one dimensional, their motives not as developed or well explained. Arch enemy (andÂ chief ranger) Martin Van Kamp is made into something resembling a cartoon. While anÂ element of the ridiculous can certainly add to the comedy in a fun novel like this, (andÂ is used to great effect by Tuccille elsewhere in the story) here it detracts from the levelÂ of danger we feel the heroes to be in which in turn undermines some of the tension andÂ conflict that propel the plot. Tuccille also makes the odd decision to break up the book into incredibly small chaptersÂ (many no longer than a page). While breaks come at logical times, having to pageÂ through to the next chapter after only a short couple paragraphs interrupts the flowÂ unnecessarily. Happily the rest of the story flows so well that it weathers these interruptions with ease. Â The plot is fun and tight, the philosophy not overwhelming, the local flavor excellent forÂ anyone who enjoys hiking and the west, and the ending satisfying. In all, BarbecueÂ is an easy book to recommend and a fast read for anyone interested inÂ libertarianism, the outdoors, or both. The PDF version (157 pages) can be bought on Lulu for $2.99 and a print version foundÂ on Amazon for $8.63 . Â You can also visit the author’s website atÂ http://www.tuccille.com/. Thank you for a very fair and well-considered review. I concede that some of the characters were a little cartoonish (I was trying to have fun with them, more than anything else) and the short chapters have a jump-cut quality. I did that effect, but I know it doesn’t work for everybody. I’m very happy that, ultimately, you enjoyed the book! J.D., as I said, a very easy book to recommend, and we look forward to any other fiction you might write!